Launched at the latter end of 1931 in readiness for the 1932 model year were two entirely new MG models. "Motor" magazine dated September 8th 1931, billed the 12-70 h.p. Magna Six as the most interesting one, with the smaller 4 cylinder, 847 cc D type running a close second. Originally designated as the Magna Six, the car soon became known more commonly as the F type Magna and was first available in two versions either as an open four seater priced at £250 or as our feature car this month shows, a very attractive Foursome Coupe which sold for £289. The reason for the introduction of the D and F type, stemmed from the need for some medium sized cars to fill the gap in the MG range between the highly successful M type Midget and at the other end of the spectrum, the large and sedate 18/80. Released in 1928, the M type was soon to capture the imagination of the public with its successes in motor sport and the fact that it offered meaningful performance at reasonable cost. This simple little sports car with its 8 horsepower, 847 cc Wolseley based engine had comparable performance to its larger stablemates, the 18/80 and 14/40, but at half the cost. It was so popular that it accounted for over 50% of production in the year following its introduction and was one of the reasons that the MG Car Company were forced to move to larger premises from their small mews garage in the centre of Oxford to former Pavlova Leather works at Abingdon-on-Thames. 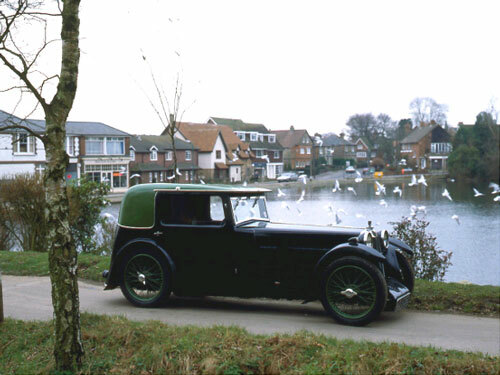 This move noted the end of the Morris side valve engined cars with all efforts concentrated on increasing the production of the M type to meet public demand. Kimber turned his attentions towards Wolseley in need of a more modern power unit for the projected F Type. He focused on the Wolseley Hornet that had been introduced in 1930 and although he was not particularly impressed with the car itself he saw the potential in using a modified version of the 12 horsepower engine in an MG. The unit itself was not a new design although more up to date than any that Morris could offer. Abingdon tried to pretend that it was something new by camouflaging the exterior of the block with metal sheeting, disguising its origin but also adding to cooling problems. Often referred to as an M type engine with two cylinders 'tacked on' the 1271 cc unit had a meagre power output of 37.2 bhp at 4,100 rpm that resulted in disappointing performance. The Wolseley cylinder head was ported solely on the nearside with four inlet and five exhaust ports. A large cast iron inlet manifold sported twin carburettors whilst a finned exhaust manifold routed at the front of the engine followed a similar line to that of the M type Midget. A belt driven fan was fitted to aid engine cooling with the F type being the only overhead camshaft MG to have one fitted as standard. The vertically mounted dynamo formed the drive to the camshaft that was of distinct M type origin. The overall appearance of the engine was very neat, attributable no doubt in part to the aforementioned cladding. The engine was then mated to the hefty racing type four-speed ENV gearbox utilising straight-cut gears as used on the Montlhery C type Midget. The F types generally lacked performance, particularly with four adult passengers on board, nonetheless they were well received and sold steadily alongside the M type and D type. There is no doubt that it was a genuine sportscar that was appealed in any of its various body options and with its long bonnet and raked radiator grille, certainly looked the part! With an undeniably smooth engine that had plenty of torque throughout the rev range and a gearbox that provided near perfect ratios, the combination afforded the right formula for pleasurable driving. No doubt due to feedback from owners of the first cars, the Abingdon engineers were soon working on extracting more power from the engine and in readiness for the 1932 Motor Show, a few other modifications were implemented. Higher compression, improved valve timing and larger carburettors contributed to a 27% increase in power whilst larger 12" brake drums and extra water manifolding to improve cooling, completed the package. These modifications were seen as major improvements and gave an added boost to sales. The range at this time was extended to include a two seater version designated the F2 which looked virtually the same as the J2 but also had the benefit of previously mentioned 12" diameter brakes that had been developed principally for the racing C type Midget. The four seater Salonette was considered a well appointed car for its time and although somewhat cramped interior wise was quite refined. The distinctive glass sliding roof, often likened to 'a church window' provided good ventilation and some relief for claustrophobics! The bucket seating was described in brochures as 'close coupled' but as you would expect along with the rear seat and trim panels they were upholstered in quality leather. Accommodation for passenger luggage was somewhat restricted with the boot area totally swallowed up with the 6 gallon fuel tank. The hinged boot flap did have built in stays however that affixed to the lower trim rail in order to turn the flap into a horizontal luggage platform. In addition to the two seater, four seater and salonette versions, there were also variations on offer from specialist British coachbuilders of the day such as Jarvis, Styles, Abbey and Carlton to name but a few. Bore & stroke: 57mm x 83mm. Power output: (early cars) 37.2 bhp @ 4,100 rpm (later cars) 47 bhp @ 4,100 rpm. Gearbox: ENV manual 4 speed non-synchromesh. Brakes: Mechanically operated 12" drum by Bowden cable. Wheels: Centre-lock Rudge Whitworth wire spoke. Wheelbase:7' 10". Track: 3' 6" front and rear. Price new in 1932: £289.